Ok. That’s not entirely true. Unless you consider Nashville, Tennessee another galaxy. 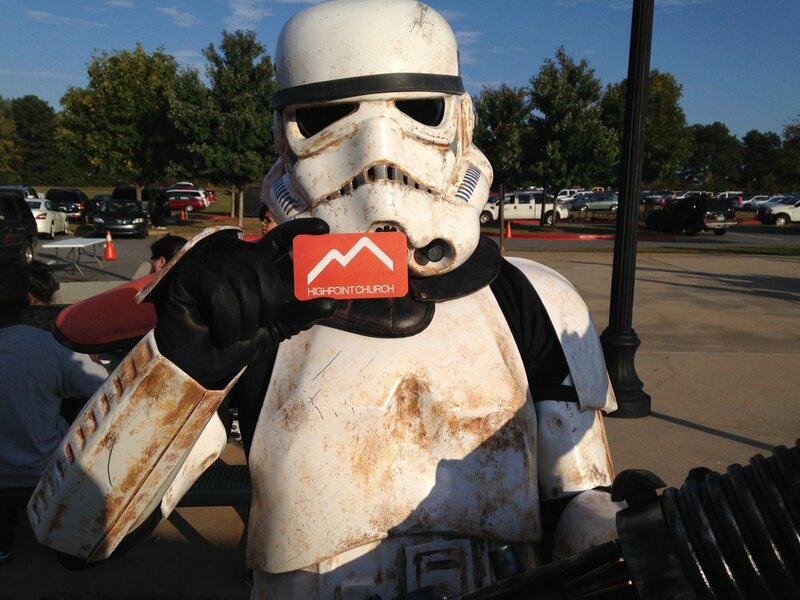 But apparently even storm troopers like HighPoint Church. (We aren’t sure how to feel about that.) HighPoint’s story begins with Pastor Andy and a bible study for fraternities. Having grown up in the church, Andy had a love for God but had never experienced discipleship or engaging in God’s mission. As a college student, he attended a bible study for students, met Amy along the way, and soon they found themselves with an unshakeable desire to see people living passionately for Jesus. After serving in college ministry with Every Nation Ministries for six years in Nashville, Andy and Amy felt a strong call to reach an even broader group of people by planting a church. But before they took that step, they wanted to receive more hands-on training and equipping. So they accepted an invitation to join the staff of a newly planted Every Nation church in Orlando, Florida. Andy and Amy served the HighPoint family with former NBA player, Keith Tower, for over six years- a critical time which gave them insight, perspective, and invaluable experience, as well as deep and fruitful relationships. But they never forgot their original dream, and in 2012 they began to focus on planting a new church. After much prayer, visiting Kennesaw, and meeting with several families in the area, they knew that God was undeniably calling them there. HighPoint started as a bible study in a living room. After spending time getting to know Kennesaw and the Atlanta area, Amy and Andy started a bible study that eventually grew out of their living room and into their neighborhood clubhouse. For roughly nine months, this young church met in a home, a clubhouse, had baptisms in the backyard, and eventually grew into renting a school. In August 2014, HighPoint moved to Kennesaw Elementary School. Andy and Amy served the HighPoint family with former NBA player, Keith Tower, for over six years- a critical time which gave them insight, perspective, and invaluable experience, as well as deep and fruitful relationships. But they never forgot their original dream, and in 2012 they began to focus on planting a new church. After much prayer, visiting Kennesaw, and meeting with several families in the area, they knew that God was undeniably calling them there. Working with Every Nation Ministries, Andy began traveling to Kennesaw to lead Bible studies, meet people and hear their stories, and share the vision that God had put on his heart to establish a multi-ethnic, multi-generational church in the area. In the fall of 2013, the Kings answered the call to move to Kennesaw and HighPoint Church officially started. Now, HighPoint continues to meet at Kennesaw Elementary, is engaging young families in the community, has a thriving college ministry, and continues to develop young missionaries passionate to change the world for Jesus! Several years later, the lives of many students and families have been forever changed by the power of Jesus.